When people think of 2D platforming the first tendency, for good reason, is to think about the likes of Mario. Running, jumping, some power-ups along the way… these are classic elements that have become the staples of the genre. 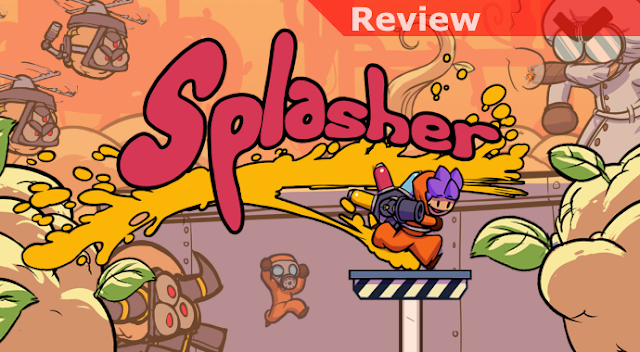 The developers behind Splasher seem determined to help you think a little differently, mixing in a number of elements from the likes of Portal 2 and maybe some Super Meat Boy as well to create something much more insane, challenging, and (dare I say it... ) fluid. Sporting a very attractive and colorful animated art style at first glance Splasher could be mistaken for a more casual affair but within a few levels any thoughts in that direction can be shoved aside. While not as cruel as the likes of Meat Boy and its ilk you’ll still need to work hard to hit your jumps accurately, properly utilize the painted surfaces that allow you to stick to or bounce off of the walls, and knock out targets along the way to trigger traps like buzzsaw blades and laser beams. Initially you’ll only be able to shoot water yourself and nozzles in the level will spray the paints on the wall so you’ll only need to work on making the proper use of them. Within just a few stages you’ll be given the paints yourself to splatter on the floor, walls, and ceilings and at that point it really steps up the challenge since it leaves it to you to not only decide which surface you need to paint how but also sometimes what combination of action you need to manage in specific sections, jumping, spraying the wall, bouncing off of it, shooting an enemy, and then landing on another platform where you can finally take a breather. What I love most in the game is how the challenge evolves as you play and how it then gets to be even more crazy fun. At the most basic level you can choose to merely survive a level, making your way from the start to the finish. For an extra challenge you can try to get all of your buddies who you’ll see on your way and who will tempt you to stray from your path and risk dying to rescue them. To step it up even further you’ll need to collect sparkling paint along the way, cleaning it off of surfaces, killing some enemies, or shooting special spinners. If you manage to collect enough by the end of the level you’ll then be able to get the exclamation mark to top off your friends who’ve spelled SPLASH and then you’ll be ready for the real fun! If you thought the game was great in the straight-up Normal mode, it really shines when you take the challenge and play in Speed Run mode. While I don’t normally get into them there’s just something special about the flow in Splasher where, once you get in the zone, racing through the levels and nailing all of the jumps and moves feels exhilarating! All that said, there are some stumbling blocks along the way. The biggest issue, though I certainly did learn to compensate for and live with it, is that stopping is just a little too slow for my tastes. Early on I had a tendency to struggle with landing on platforms, often hitting them but then not being able to stop or then trying to correct in mid-air and then overcompensating. No doubt there’s not a universal standard for how things should work at this level but where games like Super Meat Boy seem to get it right from the very first step Splasher seems just slightly off, though admittedly not by much. Where precision is so vital, though, it isn’t quite as perfect as I’d like. Another concern will probably be how the game’s appearance doesn’t do a great job of conveying the level of challenge that you’ll be facing. While it is enormously rewarding for gamers who live for this sort of thing there’s no doubt less experienced gamers will be spending quite a long time repeating the same tough sections. 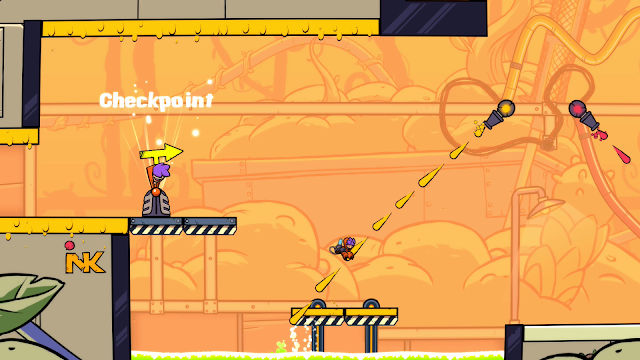 Splasher is simply a whole lot of challenging platforming fun, requiring you to be on top of your game both mentally and physically. Once you get into the flow of things it is pretty amazing how fluidly you’ll be able to move through the levels, aiming and shooting mid-air while you dodge between traps and enemies. What sometimes starts out seeming to be a formidable challenge will fall with some repetition and tuning and the sense of accomplishment when you complete some of the levels is substantial. If you’re up to the challenge you’re in for a lot of fun! Even more challenging and fun in Speed Run mode!